Hello Book lovers of all kinds, and welcome to my new blog of the day. 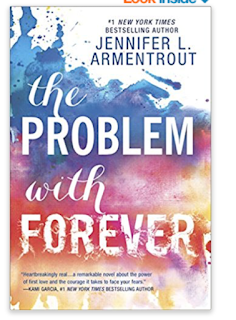 Today’s blog will be about the Book “The Problem with Forever” by Jennifer L Armentrout. This book was release to the public in Hardcover May of 2016. I bought it in February of 2017 and the paper back version is set to release June 27th, 2017. Now lets get on to the summary of the book then my review. This book is about a young girl by the name of Mallory Dodge and a young man by the name of Rider Stark. These two first meet when they are younger, while living in America broken foster care system. The home they live in was abusive and Rider ended up protecting Mallory more then most boys of a young age should be doing. Mallory was about seven or eight, when the abusive foster parent cause her to burn herself. This lead to the abusive foster home being investigate and these two children where separated. Mallory found a great home with great adoptive parents by the Name of Carl and Rosa. While Rider spent more time being shuffle around the system like most kids experience. Then when they are about 15 and 17, they ended up in the same High school. Things have change for both of them and some of it was not for the better. Rider lives in a dangerous part of the city while Mallory has a great life. But these things don't stop them from maybe finding love and while at the same time experiencing a heart breaking world that many under privilege kids experience every day. But this is where I leave you all, if you wish to know more, you need to buy the book. I rated this book a five out of five stars. Jennifer as an author, did an amazing job of describing a very painful world as well as a different culture. She had hispanic and white American culture mixes in this book. She talks about the lost of life and how we can experience it. She really helps you to understand that you can’t lose yourself,when everything around you is falling down on you. She helps you to see that in order to have a forever you must see the hope of the next day, the hope of second chances. Mallory and Rider as characters where so well defined, so emotional. Mallory experience of dealing with therapy and a painful past was beautiful and was so well written. Jennifer made you feel the emotional experiences that these characters where dealing with along with the high school love story that comes from deep friendship. I absolutely loved this book and it should be a must read for everyone out there. It describes the foster care system in America, so well. It describes how beautiful love can be but also hurt at the same time. It shows you what it means for teenagers, when they see on a day to day bases, a society filled with care but also without care. It shows a privilege and a non privilege world so well. It shows more then the rose color glasses wants to see. It hurts but it forgives and starts again. Like I said this is a book that is a must read and a must own. I now can’t wait to read the rest of Jennifer’s books. As always all of the links for the author will be below along with my social media links. Please share and follow me.